In Rome, sunset brings unexpected magic. 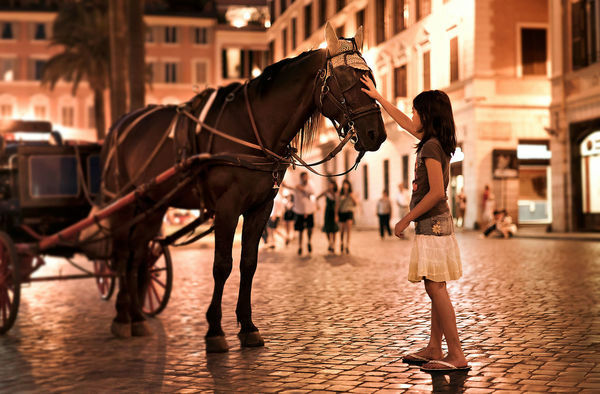 A stroll in the cool of the summer evening is made memorable by the romance of the Eternal City. The tourist who retreats at night to an air-conditioned hotel room is missing the best time to plunge into Rome. Once the museums close and the crowds thin, Rome relaxes. The city — so grand and monumental by day — becomes intimate and approachable. On my Roman night walks, I like to sit so close to a bubbling fountain that traffic noise evaporates. In the evening, it's fun to jostle with kids to see the gelato flavors or watch lovers straddling more than a bench. While strolling past polizia in flak-proof vests, I marvel at the ramshackle elegance that softens this brutal city for those who were born here — and can't imagine living anywhere else. These are the flavors of Rome, best enjoyed after dark. I learned about the city's shape-shifting back in 1999. I was in Rome, ready to film a TV episode called "The Best of the Eternal City." But as the millennium approached, the best of the Eternal City was all under scaffolding, undergoing restoration. How could we shoot without the Colosseum or the Pantheon? Traumatized, I sat down with my crew to explore our options. We considered going home or heading for Sicily to film a program there. But in the end we decided to salvage something in Rome and came up with a new script: "Rome: Baroque, After Dark." Shooting the city after dark turned out to be a delight. Rather than imposing arenas and temples, we enjoyed convivial piazzas with kids kicking soccer balls until midnight, splashing fountains softened by velvety lighting, and marble benches populated by ice-cream lickers. It's easy to do. My plan for a perfect night in Rome starts with an early evening stroll — the ritual passeggiata. The streets of central Rome are safe and inviting for a walk at dusk, and there's no better way to feel the city's pulse. If you want to be elegant, join Rome's passeggiata in the area around the Spanish Steps, where chic people window-shop in front of upscale boutiques. For a more come-as-you-are vibe, head to Piazza Popolo or Via del Corso. Working-class youth from the suburbs converge in these spots, like American kids gathering at the mall. Italians call this spectacle the struscio (literally, "the rub"), with everyone checking each other out. After a sociable stroll, I take a break with an aperitivo — a before-dinner drink. Pick a rooftop bar at a hotel for a splurge, or just settle in at an outdoor café on a square. You can sit comfortably — and for as long as you like — with an overpriced drink and enjoy a front-row view of Rome unwinding. When it's time for dinner, you'll find that Romans love to dress up, go out, and socialize with friends. You'll fit right in if you dress up a bit too. A square that might be a tiny vegetable market by day morphs into a dinner destination with colorful eateries by night. At Italian meals, it's all about the pace of things. Rome has a few fast-food joints, but they're held at bay by places that celebrate slow food. Dinner alone can easily become the evening's entertainment. 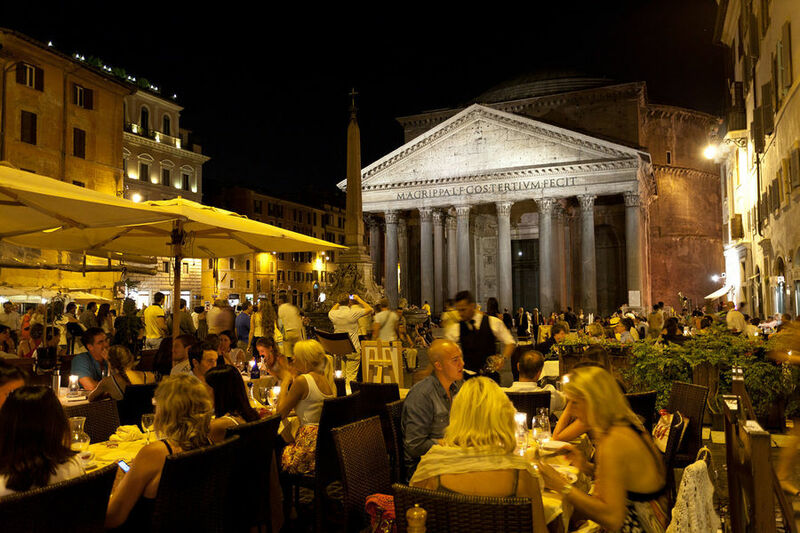 Clustered around a rickety table outdoors, with traffic roaring past and crowds milling by, Romans still manage to create a little slice of intimacy. Rome has a couple of fun after-hours neighborhoods. The lively new hot spot, with plenty of good eateries, is called Monti (it's just beyond the Colosseum). But if you don't have enough money to take your companion out — no problema! The main piazza in Monti is an impromptu people-gathering point. Conveniently, a kiosk at the top of the square sells cheap bottles of beer. I'm also a fan of Trastevere, Rome's "other side of the tracks" — in this case, the other side of the Tiber River. Rome may be a big bustling city, but Trastevere proves that it's never lost its village feel. Coming here, you enter the intimate side of Rome — a place of red pastel buildings with green ivy hanging down, and little squares peppered with cafés and pizzerias, perfect ringside seats for observing the river of life coursing through. I skip my restaurant's dessert when I'm in Rome — I'd rather wander the medieval back lanes with a late-night gelato. Walking down a cobbled street, softly illuminated as if by torchlight, it's easy to imagine I'm rubbing shoulders with the past. In Rome, give me the night. Rick Steves (www.ricksteves.com) writes European travel guidebooks and hosts travel shows on public television and public radio. 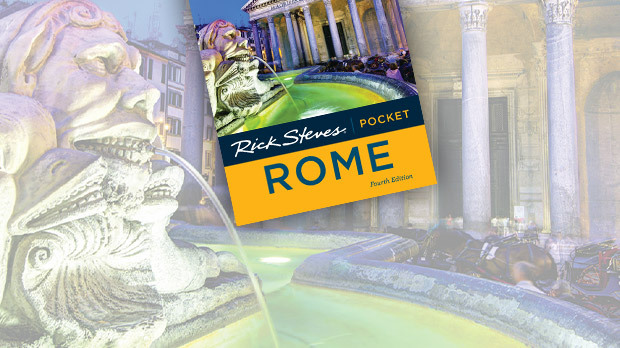 Email him at rick@ricksteves.com and follow his blog on Facebook.